260 Article-Inspiring Templates Designed to Make Your Writing Faster and Easier! Yesterday we announced our largest and newest ‘260 Ultimate Article Template Package’ with 260 unique templates that you can use to immediately help you write more high quality original articles in less time. Now, the Cyber Tuesday (like Cyber Monday) introductory special was only for the first 24 hours, but seeing how many authors took advantage of this package, I decided to add (1) huge new bonus to encourage you to take us up on the offer before we raise the price to full retail. BONUS: If you act before Noon (Central Standard Time) Friday, December 5th, you’ll receive the AudioBook Version ($97 value) of the entire 260 Ultimate Article Template Package so that you can have over 10 hours of MP3’s to listen to (or in addition to reading)… to inspire, educate, and entertain you while you leverage this learning/discovery method to create more fresh articles that can then be used to help build your brand, your business and your sales! It’s going to take us 2 weeks to produce this new AudioBook version, but we promise it’ll be done and delivered before Christmas (December 25th, 2014) to all owners of the 260 Ultimate Article Template Package. You’ll receive an email along with a MP3 download link. All current owners of the 260 Ultimate Article Template Package will receive this bonus as well when it’s released before Christmas! When you write articles you invest two things: time and effort. Article templates make it faster and easier to write high-quality original articles that will build on your brand, increase your exposure, and add credibility to yourself, your business, and website. Ultimately, this will help you increase traffic and sales! With templates you not only get fresh ideas for unique and informative articles, you also get the recommended structure for each article. This alone will save you countless hours of brainstorming, planning, and plain old hard work. Those hours can be used to write more articles and increase the size of your article portfolio … or, better yet, they can allow you to take that much-needed break! You’re an expert in your niche, in your craft and in your business. For you, writing and sharing your expertise flows very easily; but there are days when you just can’t be “creative on command.” Even though you know your material, figuring out what specifically to write about may elude you. That’s exactly the problem these article templates will solve; and with thousands of downloads, we’ve been able to determine which article templates our customers love best. Released for the first time today, this new package leverages the best-selling article templates and introduces new ones never released before to help you speed up your ability to write high quality original articles that can help bring more traffic and qualified leads back to your website. Why Invest in the EzineArticles 260 Ultimate Article Template Package? It’s new, it’s our best value, and our team painstakingly reviewed every single current article template that we’ve had in our inventory, but we also created more than a dozen new templates based on which article templates were in most demand. Compared to our 52 Article Template Package, you get 1 great article template for every week of the year for just $19.97 and then with our Build Your Own Article Template Packages, you get 15 article templates in each package for $14.97 per package x 14 separate packages and 225 separate PDF files. Yikes! If you had to buy them all separately, you’d invest more than $229! … And even with our volume discounts, you’d still be paying over $105 for every article template we currently have. That’s why we created this new ALL-IN-ONE 260 Ultimate Article Template Package so that you’d be able to benefit from the totality of our experience in helping expert authors like yourself to write more new fresh quality articles in less time. Your time is valuable and this new product will help you short-cut to writing a higher quality and quantity of articles that can then be used to bring more traffic back to your website, create a new eBook PDF of your own or even compile an entire book of your expertise using all 260 article inspiring idea templates. With this new 260 Ultimate Article Template Package, you get (5) article template ideas for every week in an entire year! That’s 260 unique article templates with no repeating! Don’t spend $229, or even $105 purchasing 15 different products. Instead, be one of the first to leverage 260 article templates, 5 for every week in a year, all instantly downloadable in PDF format for one low price of $77 USD! At the crazy introductory investment of only $77.00 USD, that’s 66% off our retail price and 27% off our already volume discounted price, plus you get many brand new never-seen-before article templates in the EzineArticles 260 Ultimate Article Template Package. Remember, this is a Cyber Tuesday sale, so act today to get this best value deal. In addition, you’ll get the AudioBook version in MP3 format ($97 value) as soon as we have it produced, but no later than December 25th 2014! You get the PDF ‘260 Ultimate Article Template Package’ instantly with your investment today and then we’ll email you a link to download the 10+ hours of MP3’s so you can see and hear 260 creative article writing template ideas! Don’t miss out on this great price, BUY NOW! We’re so confident our time-tested article templates will help inspire you, help save you loads of time and gently give you that push or nudge to help you through the “writers block” that hits all of us from time to time … that we’ll take all of the risk. If you’re not blown away with the value included in this package, just email our customer service team and we’ll promptly give you a refund the within next business day. 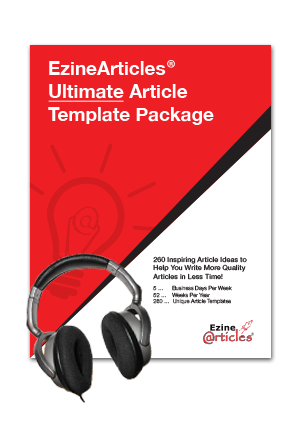 That’s how much we believe in the value that you will receive when you download the brand new EzineArticles 260 Ultimate Article Template Package of 260 article templates. Give yourself a break, let the EzineArticles 260 Ultimate Article Template Package inspire you with 260 article template ideas that not only give you the idea and instructions on how to use the ideas, but each template has its own visual example so you can get writing even faster, easier, and better than ever before. Hurry before it’s too late! This offer ends Friday, December 5th at Noon CST (Chicago USA time) … BUY NOW! Another awesome offer by EzineArticles. Great! I have just downloaded my 260 templates and have reviewed them. They all look great. But my idea of “templates” seems to be different than yours. So my question is what are the logistics of putting them to real use? Do I copy and paste the template that interests me and is in line with the theme of my article? Do I do so in a word processing program then write my article around the suggestions in the template? If I am somehow missing the point, please let me know what is the best way that you suggest to use these templates. P.S. And I do look forward to the audio portion. The PDFs are designed so you can model your own content after the template in a separate document. This will ensure your content is original and won’t match anybody else’s content. I recommend opening a word processor in a window next to the PDF and writing while looking at the PDF. Please let us know if you have additional questions and we’ll gladly assist! Great offer, the good article templates will lead on inspiring a great idea. Awesome. This is a great idea. I think this will help to improve blog writting skill for many people. This is very helpful and easy to learn. Thanks for your offer. I found it more useful information.